Relish the memory. : Rhubarb has it. There is no denying it. Summer is well and truly on it’s way. Thankfully for the humble Rhubarb seasonal consumption has no boundaries, as it is available all year round. While having a mild laxative effect, this mighty root blends beautifully with apples, strawberries, ginger and citrus flavours. Which makes it a great companion for baking or breakfast dishes. Bircher # 1 c/o The Good Oil, Dunedin. Perfecting stewed rhubarb is something of an art, and a cooking process that has always intrigued me. My experience stewing rhubarb often ends in a slimy sloth-like goo. That tastes heavenly but looks a little worse for wear. A friend and I established that the water : sugar ratio is the issue. And my latest purchase ‘Encyclopedia of Food and Cookery’ suggests using only a small amount of water as rhubarb releases water and shrinks when it cooks. But in the mean time I will continue to strive for rhubarb perfection. 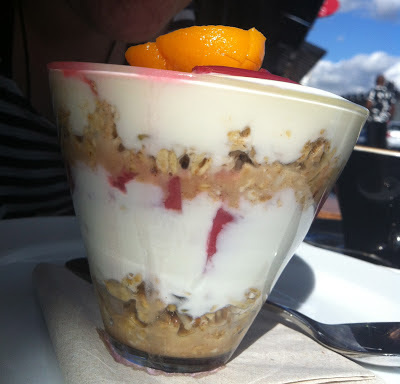 Bircher Muesli seems to have become a staple on many a breakfast/café menu around about town and rhubarb has played a starring role in both of my recent bircher experiences. Something about the match of delicately stewed tart and sweetened rhubarb seems to match the hearty earthy-ness of oats perfectly. Atomic Coffee Roasters in Kingsland, Auckland has my heart sold on their version of Bircher Muesli (and their exceptional coffee!). Packed with chunky oats, cinnamon, coconut and natural yoghurt and studded with delightful plump chunks of rhubarb peeping through the glass. Topped off with a poached, slightly tangy tamarillo its pretty jolly great. 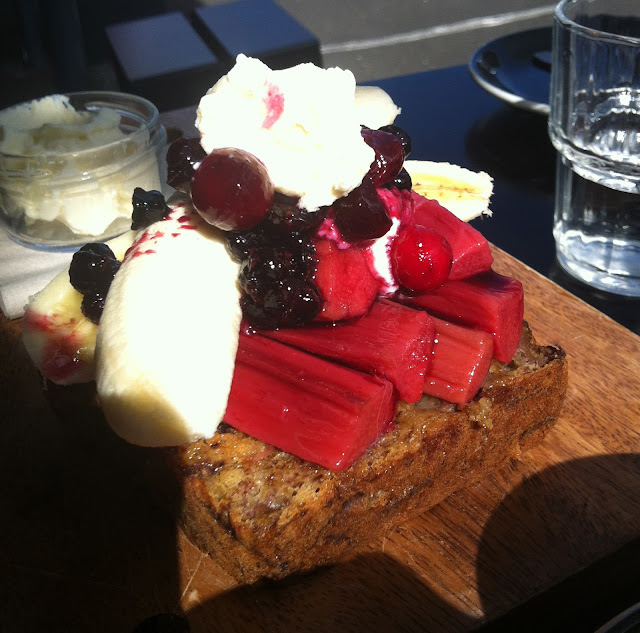 After conquering Mt Eden; Ray Charles and I had worked up an appetite and could not go passed their sumptuous Banana Bread. Served w. poached rhubarb, berry compote and lemon ricotta it was A-M-A-Z-I-N-G. And of all the things on the wooden board the rhubarb disappeared first. Bircher + Banana Bread = Best Birthday Breakfast. 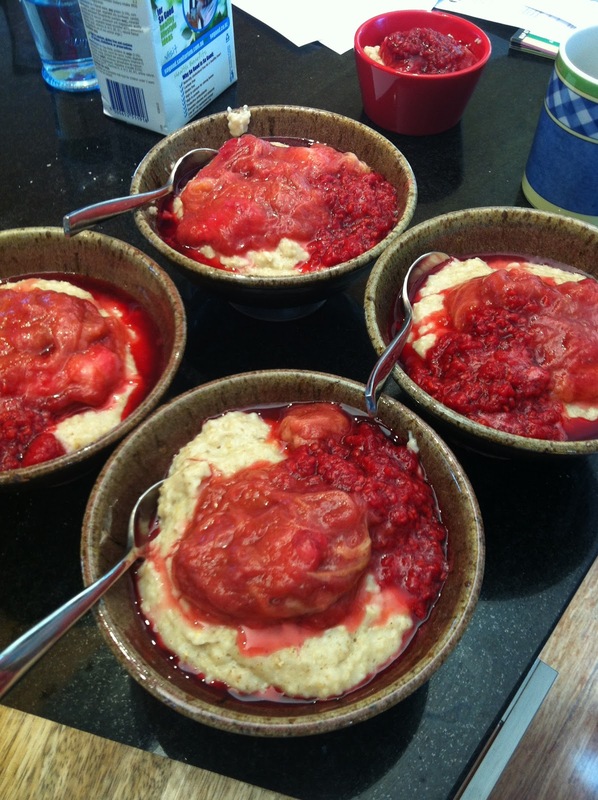 Speaking of birthdays, breakfast on another occasion earlier this year involved a mighty batch of soy cinnamon porridge topped with stewed rhubarb, fresh raspberry coulis and sprinkled with brown sugar. With her impressive vege garden this birthday ‘Belle’ provided the luscious homegrown fruit which made it all the more enjoyable. Another homegrown rhubarb treat was a rhubarb crumble pie served by the sweetest family. The Joyful Vegan Cafe Caravan is notoriously known at the Otago Farmers Market for its Veggie Burger and Five Grain Loaf (which I am confident can take on vogels). All packed full of goodness, flavour and animal free they craft savoury wraps, burritos, enchiladas, dahl, and an uber healthy tempeh broccoli kale salad. 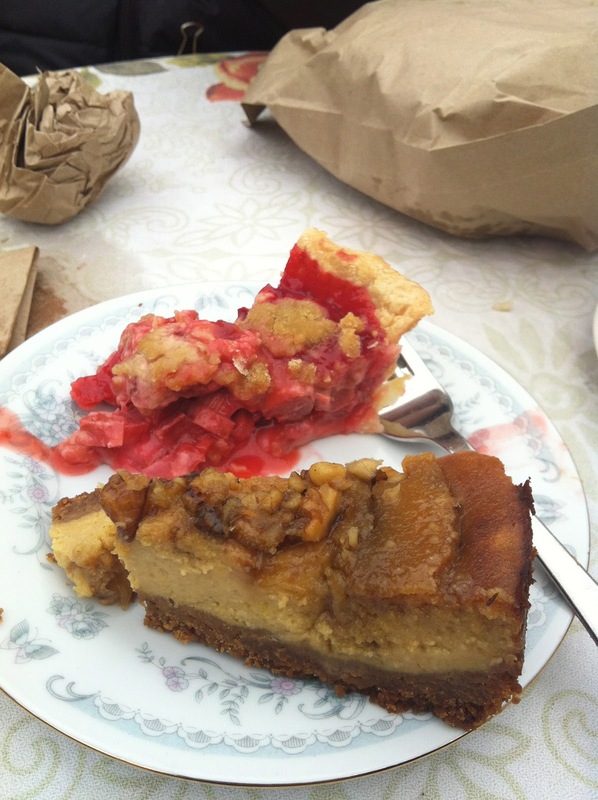 At the humble price of $2 their slice of rhubarb joy exceeded expectations. A pink filling packed full of pleasantness, tasted even sweeter shared among friends. Rhubarb Crumble & its' Pumpkin spice companion. So it’s not a rumour. Truth be told. If it’s an intricate bittersweet breakfast treat or distinctive tart flavour to enjoy then Rhubarb has it.